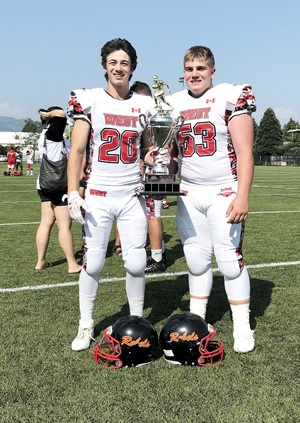 Returning triumphantly from a victory at the ACG All Canada Bowl for Team West, two W.R. Myers Rebels football players are hoping to use that momentum for a provincial run in the fall. Mike Sawatzky helped Team West pitch the 14-0 shutout victory, patrolling the team’s secondary at halfback/safety, while Ashton Werewka created holes on the offensive line at guard. “I was listed at centre, but I played mostly guard. I was starting right guard and I got taken out one time the whole game,” said Werewka. With the Canada Bowl played on the last weekend of July in Chilliwack, B.C., Werewka noted Team West was able to move the ball more consistently than Team East but drives stalled at a critical time for the potential for the score to be much higher for Team West. “Their offence was finding it hard to move the ball, our offence was getting first downs after first downs, but we were stalling near the goal line,” said Werewka. One of two of Team West’s majors were helped greatly by Werewka who got into the second tier of Team East defenders, which sprung a score. Sawatzky says the game provided a good boost to his game as he got the chance to line up against some of the best players Canada has to offer. “It was generally a good experience, good coaches and it was awesome to play against some of the best players in the country,” he said. Werewka has made many travels in his football career, going far past the traditional fall high school season. Participating in various camps and all-star games in the off-season, Werewka also participated in the ABC Border Bowl for Rising Stars which helped him get selected for the Canada Bowl with his impressive tape. “You sent in game film and they picked the best guys they felt would fit in with the team best,” said Werewka, adding Team West was able to get four practices in before playing in the Canada Bowl. It was a bit of a learning experience for Werewka who had to learn to adapt from playing his traditional centre position, along with playing on the defensive line. All those experiences Werewka hopes will propel the high school senior to a season to remember for the W.R. Myers Rebels football team, using his veteran presence to anchor both the offensive and defensive lines. Training camp is currently underway for the W.R. Myers Rebels football team and both players have high hopes for the W.R. Myers squad on the gridiron that has had plenty of success in recent years. Sawatzky also feels the game helped get him in the right mindset as the Rebels teammates prepare to head into the 2018 football season. “It prepared me really well, especially because I went up against really good players,” explained Sawatzky.